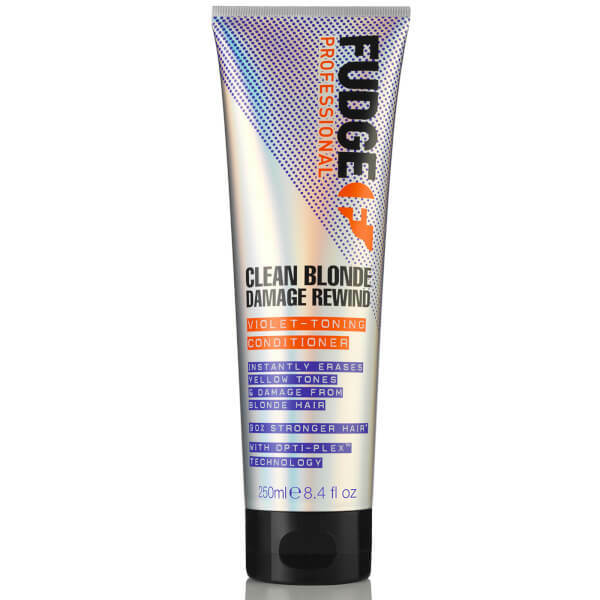 Revitalise your tresses with Fudge Clean Blonde Damage Rewind Conditioner; a multi-tasking formula that works to soften, replenish and strengthen strands from root to tip. Powered by neutralising violet pigments and hydrating Guarana Extract, the regenerating conditioner helps to eliminate brassiness and yellow tones, whilst repairing damaged hair with its innovative Opti-PLEX™ technology. Blonde hair is left smooth, healthy-looking and restored with a luxurious fragrance. Apply after shampooing. Massage through hair, concentrating on the ends. Rinse thoroughly. Aqua (Water), Cetearyl Alcohol, Behentrimonium Chloride, Glyceryl Stearate, Dipropylene Glycol, Amodimethicone, Glycerin, Hydrogenated Castor Oil/Sebacic Acid Copolymer, Parfum (Fragrance), Phenoxyethanol, Silicone Quaternium-22 Sodium Benzoate, Disodium EDTA, Citric Acid, Pentylene Glycol, Polyglyceryl-3 Caprate, Polysilicone-15, Cetrimonium Chloride, Polyquaternium-7, Trideceth-12, Hydrolyzed Vegetable Protein PG-Propyl Silanetriol, Hexyl Cinnamal, Cocamidopropyl Betaine, Limonene, Palmitamidopropyltrimonium Chloride, Propylene Glycol, Alpha-Isomethyl Ionone, Coumarin, Linalool, Potassium Sorbate, Sodium Hydroxide, Basic Blue 99, Basic Red 51.